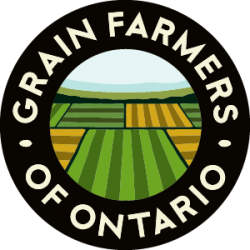 GUELPH, ON (October 24, 2013) – Grain Farmers of Ontario is set to unveil Growing Connections, a 53’ trailer highlighting grains from field to fork to fuel, next week at the Royal Agricultural Winter Fair. The trailer features three fold-out stages and one enclosed theatre room. Visitors will enter this state-of-the-art exhibit through the crop stage, which includes life-size replicas of corn, soybean, and wheat fields in different stages of growth. 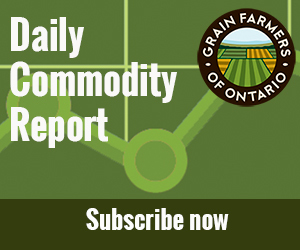 Robots from Clearpath Robotics, that work autonomously on the farm, can also be seen in this introduction to grain farming. From the crop stage, guests can visit three other stations in the Growing Connections exhibit: the video game stage, kitchen stage, and theatre. On the videogame stage visitors can engage by playing the Seed Survivor computer game and exploring a giant touch-screen map of Ontario. The kitchen stage focuses on how grains are used in food. Visitors can use a wheat grinder to make white or whole-wheat flour, learn about novel new uses for grain with the Product of the Day feature, and see a wide range of food and non-food items made from corn, soybeans, or wheat. Grain Farmers of Ontario’s Resident Chef, Jonathan Goodyear, will demonstrate custom grain recipes on this stage several times during the Royal. Visitors can take home recipe cards describing Chef Goodyear’s recipes anytime during the show. The fully enclosed theatre is a great place to sit, relax, and learn about Ontario agriculture. Visitors will find comfortable wheat straw bale seating to watch videos on controversial farming issues, see farm equipment at work, and hear from real farmers about their daily lives. The 1,200 square foot family-friendly exhibit can be seen for the first time at the Royal, November 1-10, in Hall B. The exhibit is wheelchair-accessible and fun for all ages.